But did I ever seek to know what that meant? But did I always do that? And to help me trust Him more. 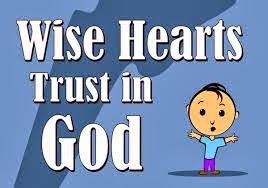 I'll put my trust in God. At certain points in our lives, I believe we often trust men more than God, but it's imperative to remember and understand that He is the supreme Being and the One whom we should place all and not some of our trust. He, His, Him - referring to God. Hummmmm, thought provoking for all ages, but but better to realise to trust God early in life.